In July 2015, LG Display announced it is going to invest $900 million to build a new 6-Gen flexible OLED fab. The E5 flexible OLED line will have a capacity of 7,500 monthly substrates - or 1.5 million 5.5" panels. The new fab is scheduled to begin mass production in the first half of 2017. 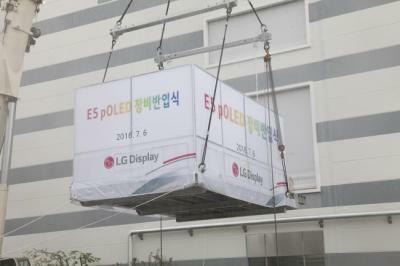 Yesterday LG Display said that it started to install production equipment in this upcoming new line, in Gumi, North Gyeongsang Province. LG also released the nice photo you see above of the equipment transferred into the fab. Oops. $900 million of course. Wonderful... because we certainly need more OLED phones.